Cross International combats malnutrition by working directly with pastors and in-country Christian ministries, whose feeding programs serve impoverished children and families in Jesus’ name. In 2018, Cross International supported Christian feeding outreaches in eight countries. This support included cash grants to 12 projects, plus more than 9 million Vitafood meals delivered. These overseas partners met the immediate nutritional needs of the poor while playing a vital role in the church’s mission to lead souls to Jesus Christ. 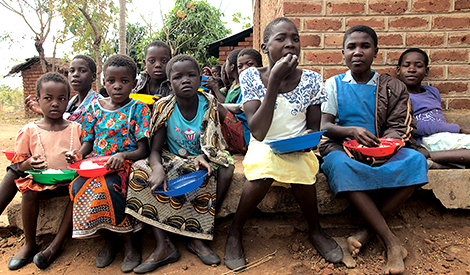 For example, in Malawi, we provided support to purchase local food for Ambuya Development Center, a ministry that provides regular meals to vulnerable children while helping them to achieve an education. In Ghana, we supported Sanctuary Child Development Center, where children receive daily meals and learn Bible stories. Beyond building up bodies weakened by malnutrition, food at school helps hungry students focus on their studies and get more out of their educational opportunities. Malawi is one of the world’s poorest nations, and children and families suffer as a result. To meet the great need for nutrition, the Ambuya Development Center provides poor local children with a daily meal as they work to achieve an education. To receive a meal, children are required to attend school daily. Local attendance rates have increased dramatically! In 2018, 291 children received daily meals at Ambuya Development Center. Six volunteer cooks also eat daily meals at the center. Ambuya offers an afternoon program for students in first through fourth grade, who only attend school for half the day. This program uses Bible stories, songs and games to share the hope of Jesus with children in need. Funds given to this project in 2018: $16,000. *The number of projects includes activities funded in fiscal year 2018. The detailed outputs are activities completed during fiscal year 2018; uncompleted activities were carried over into the next fiscal year.